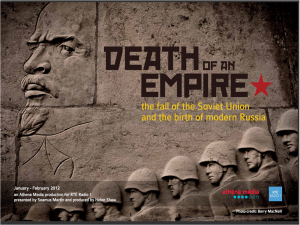 Death of an Empire, our recent radio series currently being repeated on RTÉ Choice every Tuesday at 6pm, has been shortlisted as a finalist in the History section at the New York Festival radio awards. The series, which is an Athena Media Production for RTÉ Radio 1 is presented by Seamus Martin, produced by Helen Shaw and was researched by Lisa Essuman. It tells the story of the fall of the Soviet Union, twenty years ago, and the birth of modern Russia today. The series stretches from the formation of the Soviet Union and Stalin to the failed coup in 1991 which heralded the beginning of the end of the Soviet empire. The final episode brings the story right up to date with the rule of Vladimir Putin who has just been re-elected President in the controversial March elections. The Athena Media podcast RSS is here. For further information contact us at Athena Media.